This is more a collection of well-observed moments and vignettes than a conventionally plotted chronicle. Before you read any further it may be best to clear up any preconceived notions one may have about a film titled Jesus’ Son. This is not an overtly religious or spiritual film. This is not a simple comedy, drama or romance. This is not a buddy road trip movie. This is not a story about wayward souls, drugs and junkie love. This is not a cautionary tale or a glamorization of a certain kind of lifestyle. This is not a heartwarming tale of redemption and hope. This is just a film. All clear? Good. While it is far too easy to say that Jesus’ Son is simultaneously all and none of the above it is, I’m afraid, the truth. Based on a collection of short stories by Denis Johnson Jesus’ Son tells the story of Fuckhead (FH), a young man whose clever sobriquet pretty much explains his unique position in life. Set in the early ‘70s, the film follows FH (Billy Crudup) as he journeys through addiction, love and life. The narrative of the film, like FH himself, is intentionally fragmentary, circular and confused. FH, as both the protagonist and narrator of the film, is constantly doubling back, jumping ahead and spinning around as he makes his way through his story. Dismissing with a traditional, linear format to tell the tale of a muddled young man making his way through the fog of drug addiction and love is an obvious creative choice, but one that director Alison Maclean uses with great effect. As a movie Jesus’ Son is more a collection of well-observed moments and vignettes than a conventionally plotted chronicle. The film gathers its strength and gains its narrative unity through its characters and relationships. No relationship is perhaps more critical to FH’s story and development than his tortured affair with Michelle (Samantha Morton), a combustible, self-destructing storm of sexual energy and wayward desire. Though their tenuous, volatile romance is formed from a mutual sense of loss, suffering and undefinable need there is a genuine love and tenderness at its heart. As the lover’s relationship progresses through its necessarily tragic phases, FH stumbles through a succession of evermore bizarre events populated by a cast of memorably odd characters. There is his friend Wayne (Denis Leary), who enlists FH’s help in tearing down the walls of his abandoned home to find copper wire to sell for scrap, and Georgie (Jack Black) a hospital orderly whose unique skills with a knife qualify him to either be a very gifted surgeon or a frighteningly precise killer. These hallucinatory episodes are wonderfully absurd and flow with an easy and subversive humor. As Jesus’ Son progresses from FH’s meandering adventures in self-destruction to perplexed recovery, the film loses a bit of its momentum. As the film in no way romanticizes the empty wasteland of addiction, it cannot be argued that once FH is extricated from the destructive undertow of drugs that the film loses its charm. Nor is it the case that this latter phase of his journey is any less compelling but, rather, that some of FH’s (and the film’s) vital energy has been sacrificed for the sake of simple anecdotal completion. Ultimately what binds Jesus’ Son together and makes it so memorable is the source material of Mr. Johnson’s stories and the glimmering talent of its two main stars, Mr. Crudup and Ms. Morton. Although each of their characters is feckless, maddeningly irresponsible, and unnecessarily naïve, both actors infuse their performances with a power, respect and intelligence that reveals the humanity, grace and charm of these two troubled souls. 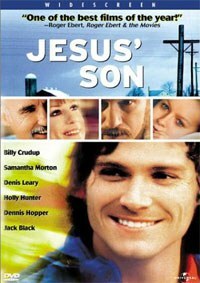 Originally released in 1999, Jesus’ Son garnered strong critical support (it won the Little Golden Lion Award at the 1999 Venice Film Festival) but limited commercial success. It was one of the earliest cinematic platforms showcasing the talents of both Billy Crudup and Samantha Morton -- two actors who are still criminally overlooked by an appreciative wider audience -- and certainly contributed in establishing them as among the most gifted actors of their generation. Thus, it is quite easy to understand why Lions Gate chose to re-issue the film on DVD for its tenth anniversary. What is less clear and rather maddening, however, is their decision to not include any extras or technical upgrades with the feature. It is more than lazy and outright negligent that Lions Gate would pass up an opportunity to highlight a wonderful, albeit idiosyncratic, movie that shines with individuality and charm. The tenth anniversary edition of Jesus’ Son on DVD may lack a certain excitement in its re-packaged release, but that is hardly an excuse for audiences to miss out on experiencing the pleasures of this uniquely beautiful film.